Three Days – Three Races! 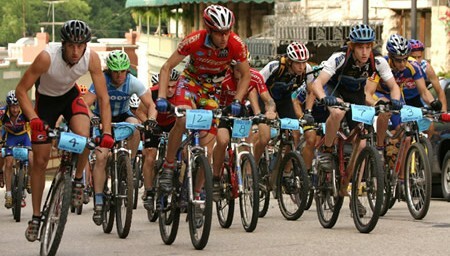 The Phat Tire Festival in Eureka Springs is introducing a new race format in 2013, the XC Tri-Omni. Offering the best of all XC worlds, Short Track, the new Super D and the Traditional point-to-point XC race. Super Fattie Omni, Observed Trials, Downhill, and the New Downhill Duo Gravity Stage Event. Come for the rush! Non-competitive rides, a Kids Rodeo and a limitless number of fun things to do in Eureka Springs mean the whole family can enjoy the Phat Tire Festival. There is something for everyone! Scheduled events happen June 12-14, 2013. Discover unique dining, shopping, nightlife and attractions in Eureka Springs or see more events on the Official Eureka Springs Calendar of Events. This entry was posted on July 7, 2013 by estcblog in Attractions, Festivals, Fun Downtown, The Great Outdoors, Things to Do and tagged adventure, downtown, Eureka Springs, Eureka Springs Arkansas, Lake Leatherwood, Outdoor.